Today, TTR warmly welcomes blogger Allison M. on the author Mary Stewart. While Stewart is best known for her Merlin Trilogy and other novels, she also wrote a book of intriguing poems entitled Frost on the Window (Hodder and Stoughton, 1991). Crawls in the cracks to blot the lines beneath. Today is National Poetry Day so I flicked through Mary Stewart’s Frost on the Window and other poems. I thought I was looking for something light-hearted, verse about cats perhaps, but then I stopped at ‘Lidice’. This has happened before – the power in this poem stops me in my tracks. Mary Stewart writes in her foreword only that most of these poems were written before the 1950s; I imagine this poem to have been written in a blaze of sorrow and anger as soon as she heard about the Lidice massacre of 1942. First of all, what was the Lidice massacre? Lidice is a village near Prague. In 1942, during the Nazi occupation of what was Czechoslovakia, resistance fighters shot SS Obergruppenfuhrer Reinhard Heydrich (‘Hangman Heydrich’, who presented plans at the 1942 Wannsee Conference to co-ordinate a Europe-wide ‘Final Solution of the Jewish Problem’). Heydrich refused surgery by non-Germans and died eight days after the shooting. Hitler commanded that, for any village implicated in the assassination, all men aged 16 and over were to be executed, all women and children were to be sent to concentration camps (with the exception of children deemed suitable for Germanisation – blue-eyed blondes to be brought up by SS families), and the village was to be completely destroyed. Despite any real evidence that any of the villagers of Lidice had had any involvement in Heydrich’s shooting, these terrible reprisals were carried out there. From 10 June 1942 onwards the following atrocities were committed: the execution of 173 men; the separation of women and children and their despatch to concentration camps; the gassing of the children; the slaughter even of the village livestock and pets; and the destruction of the village by fire and explosive, bulldozer and plough. Later in June a similar fate befell a second village, Lezaky, after a radio transmitter was found there. You can read more about the massacre at, for example, the Holocaust Research Centre and History Learning Site websites. A happier link in some ways is this BBC one which features a survivor and mentions the response to the massacre in Stoke-on-Trent, England, with its support for Lidice and its ‘Lidice Shall Live’ campaign begun in September 1942. So now to the poem itself. and then goes on to sound, to my ears, a biblical note. ‘stone from very stone/ Has dropped’ makes me think of Jesus foretelling the fall of Jerusalem (‘there will not be left here one stone upon another that will not be thrown down’ Matthew 24:1 [ESV]), while ‘oblivion/ Crawls in the cracks’ evokes for me the devil-as-serpent: the presence of evil in what has taken place in Lidice. Mary Stewart, remember, was the daughter of a vicar and grew up with the Bible. The Bible contains some stories of complete destruction of enemy cities, where people and even livestock were wiped out and the place was utterly razed to the ground, and Hitler’s commands are reminiscent of this. These scenes of destruction in the Bible were ordered in some instances for the purpose of rooting out evil, seemingly. Hitler’s commands were the product of murderous rage and a desire to punish and terrify – the purpose was to break resistance and to do so by inhumane, evil acts. That Hitler fails in this purpose is the message of this poem. Verse two begins by echoing verse one but with a crucial change in tense: ‘This was a conquered village’ (my emphasis) – in attempting to crush life and humanity, instead the ‘tyrant’s touch’ has awoken steely determination to resist fascism. As Mary Stewart puts it, ‘you have blindly made/ Dangerous what lay dormant here before’. The poem ends with a reference from Macbeth, who killed King Duncan when he was defenselessly asleep just as the Nazi soldiers killed the defenseless villagers. I find these lines very strong, surely as much a curse as a threat, and I find the whole poem fascinating when you consider Mary Stewart’s general reputation as a writer of romantic fiction. . . .wise words for these times. A bit about Allison . . .
Allison M. first discovered Mary Stewart as a student at Edinburgh University, when she stumbled across the author’s works, as well as books by Daphne du Maurier, Victoria Holt and so on in paperbacks with glorious 60s and 70s covers in charity shops and second-hand bookshops . . .”great for taking my mind off having to write essays!” says Allison. This was in the late 1980s. The funny thing is that I just assumed Mary Stewart and all those writers to be long dead or retired – perhaps because of the marvelous dated covers. Then a friend passed me a copy of Thornyhold (free with a magazine, I think this was in 1991, tied in to the release of Stormy Petrel). My first thought was that here was a novel by someone with the same name as ‘my’ Mary Stewart – I believe I was halfway through the book before I knew it was the same writer. I forgot about Mary Stewart for ten years after that until I saw, by chance, her entry in Who’s Who. I was amazed to learn she had been living in Edinburgh – my Edinburgh! – and that her husband had been a Professor at Edinburgh University, retiring only a few years before I matriculated. I now had a full list of her books to track down and read. This was the start of my being a mega-fan! The next stage of was when I found out some of her manuscripts were held at the National Library of Scotland in Edinburgh. My children were still pre-school; I’d just completed a Literature diploma at the Open University, and I wanted a project to keep me and my brain happy. Looking at her papers led me to discover that Perdita, narrator of The Wind Off the Small Isles, had appeared in a magazine short story, ‘The Lost One’. This absolutely compelled me to write to Mary Stewart for information, and her reply cranked up my mega-fandom yet another notch! I found out everything about Mary Stewart’s writing that I could, and started collecting first editions of her books. I had some thoughts of writing a book about her to share what I knew but it never happened. Life – and especially work – gets in the way. But it was through work that I started my blog, Mary Queen of Plots, in August 2016: there is an online social media and information course developed by the Scottish Government Library called ’10 Things’ that was rolled out at my work. In the very first week of the course, there was discussion of blogs and participants were encouraged to start a blog. I had never considered blogging but instantly I knew that my specialist subject was Mary Stewart! Very niche, very low key and I decided it might be fun to try. 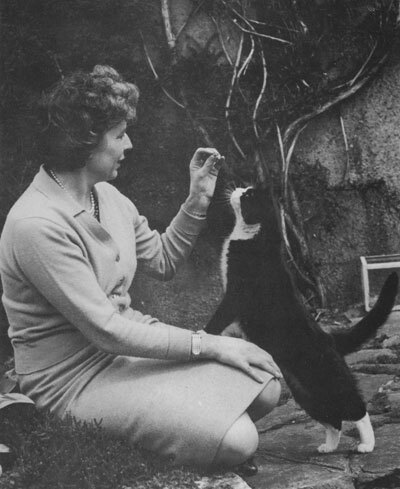 To read more about Mary Stewart, please check out and support Allison’s blog, Mary Queen of Plots, here. You’ll find discussions of many of Stewart’s works, as well as links to interviews, news clippings, etc. Thank you so much, Celeste, for featuring Mary Stewart’s poetry and my Mary Stewart blog here, it has been great fun to do. Love your blog, keep up the good work on women’s writing! Love yours too, Allison! I just purchased the poetry book plus two novels, because of you! Oh! Feeling the weight of responsibility now but hoping you’ll love them. Which novels? Madame, Will You Talk? and The Moon-Spinners . . . I really hope you enjoy them, please share your thoughts after you’ve read them! Thank you for your generosity in sharing your blog! Sister bloggers, unite!